Keen to get into Backcountry Touring but don't quite know where to start? This One Day Course is aimed at all skiers and snowboarders who are curious to see what's outside the boundaries of the ski areas. 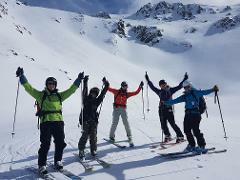 For all the ladies who want to get into Touring on a split-board - this class is a great way to set yourself up for our Craigieburn Haute Route or Snow Safety Course.